The publication of the National Audit Office’s review of the packaging recycling obligation system has again raised widespread public concern as to what is really happening to the packaging that householders recycle. But there is good news; a recent report by the Aluminium Packaging Recycling Organisation Limited (Alupro), demonstrates how an 85% recycling rate for aluminium cans will be achieved by 2020. 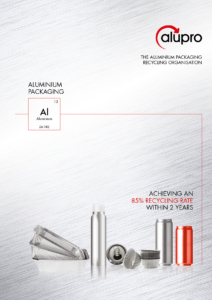 And critically, data shows that 92% of the aluminium packaging collected for recycling in the UK, is recycled within Europe[i]; this demonstrates that there is more than sufficient capacity within the EU to recycle the aluminium packaging collected for recycling in the UK. Today there is more than enough capacity to recycle all the aluminium packaging sold in the UK. It not only makes good environmental sense, it makes good commercial sense too. The recycling rate for aluminium drink cans continues to increase year on year, hitting 72% in 2017[ii] (up from 70% in 2016), whilst the national recycling rate for all aluminium packaging reached 51% (up from 50% in 2016). The report, ‘Achieving an 85% Recycling Rate within 2 years’ (published on Issuu), calls for action in several areas, including consistency of local authority kerbside collections, and the much overdue reform of the packaging producer responsibility system. The effectiveness of any solution can only be measured if ALL data is reported. Therefore, every reprocessor and exporter must be obligated to report their data as part of the producer responsibility system. Recycling isn’t a waste of time, and it does work for materials that are part of the circular economy. Householders can put aluminium packaging in their kerbside recycling and be reassured that it WILL be recycled, because of its intrinsic high value. It is endlessly recyclable with no loss of quality – real recycling in action.